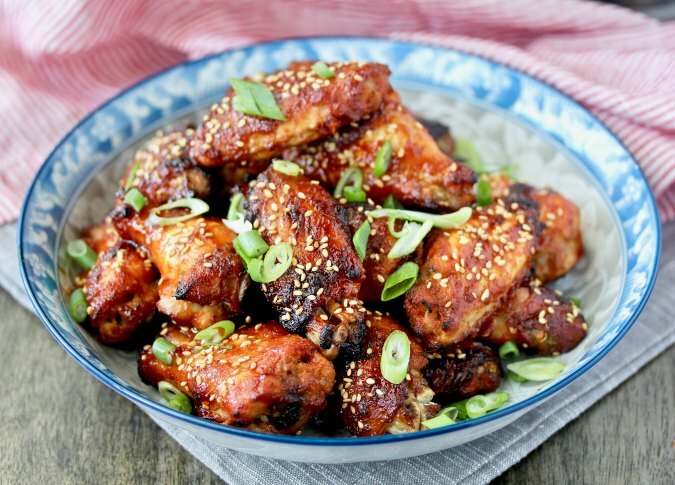 These Air Fryer Korean-Style BBQ Chicken Wings are a lighter way to enjoy the flavors of Korean wings. 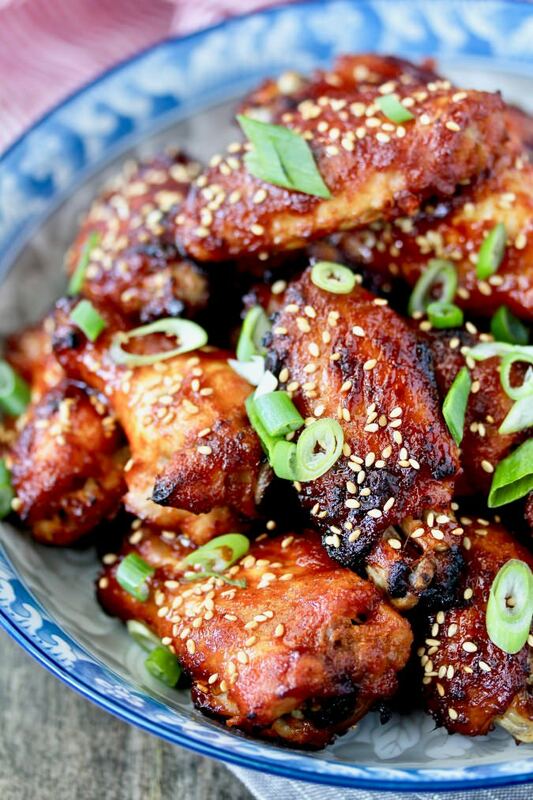 These Korean-Style BBQ Chicken Wings are marinated in a mixture of garlic, ginger, onion, soy sauce, gochujan, honey, rice vinegar, and the secret ingredient, applesauce! 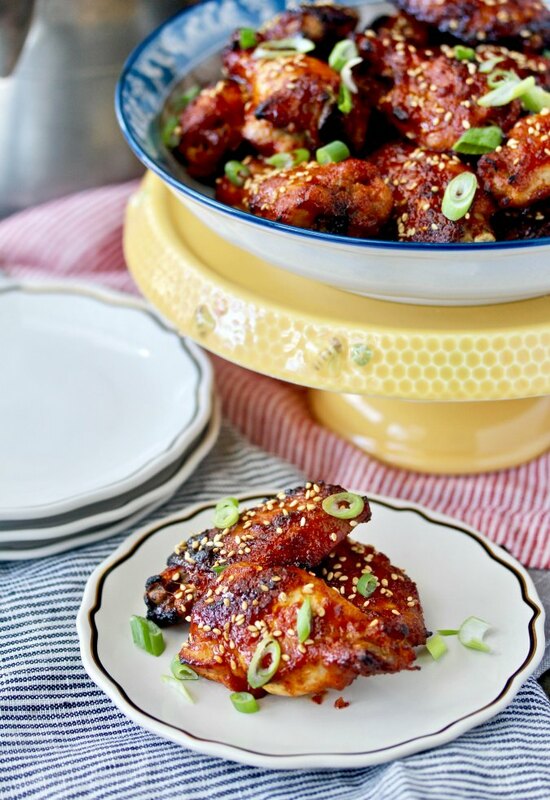 While, in my mind, nothing replaces double-fried Korean chicken wings, these air fried wings capture the flavors of Korean-style wings with way less effort and almost no oil. I'm a huge fan of chicken wings. In fact, as much as I wish a bread recipe held the title, these air fryer honey-sriracha wings are number one in popularity on my blog. 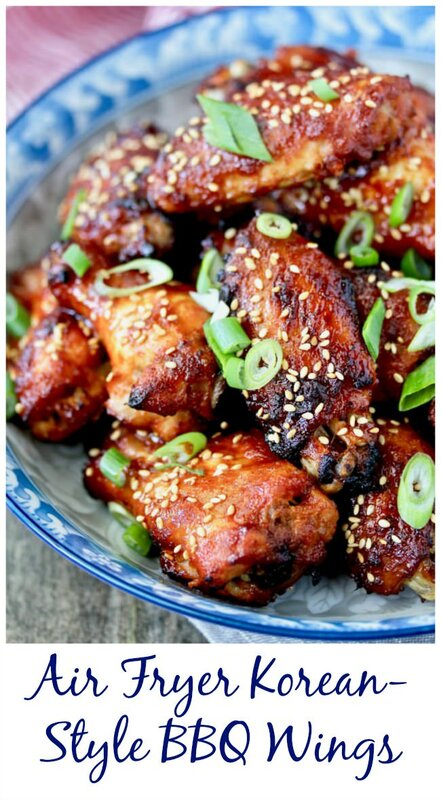 I also have some delicious slow cooker chicken wings recipes here, including these Asian Glazed wings. Then there's these Chipotle Lime Chicken Wings, and these One Pot Sticky Chicken Wings. As you can see, I'm a big fan of wings. These wings are sweet and sticky, and fabulous for any football watching party. Just make sure you have a lot of napkins on hand. To make the marinade for these wings, I used this immersion blender. It made pureeing the ginger and the rest of the ingredients easy peasy. You can also use a mini blender if you have one. If you're looking for an air fryer, America's Test Kitchen recommends this air fryer. I actually have this air fryer and it works just fine. Place the garlic, ginger, onion, 3 tablespoons of the soy sauce, applesauce, 1 tablespoon of the gochujang, 1 tablespoon of the honey, and the vinegar in a tall container, and blend with an immersion blender. If you have a small blender, you can use it instead. Pour the ingredients into a zip lock bag and add the chicken wings. Massage the marinade into the wings, seal the bag, and refrigerate overnight. Heat your air fryer to 400 degrees F. Spray the basket with spray oil. In a bowl, mix the rest of the soy sauce, rest of the gochujang, rest of the honey, and the sesame oil. Cook half of the wings in the in the air fryer and cook for about 18 minutes, turning halfway. Brush the wings with the sauce and cook for another 2 minutes. Transfer the wings to a plate. Repeat with the rest of the wings. Once the second batch is done, return the first batch to the air fryer to reheat for 2 minutes. Top all of the wings with the sesame seeds and scallions. If you don't have an air fryer, you can bake the wings in the oven (hopefully with the convection setting if you have it) at 425 degrees F for 45 minutes, brushing with the sauce during the last 2 minutes. I really need to get an air fryer. These look amazing! Thanks Kate. You don't "need" one, but they are pretty fun! We just got an air fryer. I have to try these. How delicious. You will have so much fun with it! I might have to go to bed early so I can read more of "our book"
I am "this close" to getting the one you have but I'd have to sneak it into the house. We do have an Amazon locker at work..... hmmm. evil evil laughter here... very evil. the evilest! I'm loving my new smart oven with the air fry setting. Thanks for another recipe to try. These sounds absolutely wonderful. I'm so jealous of your Smart Oven! I've been resisting buying yet another trendy kitchen appliance but dang you may have sold me with these wings! I know what you mean. I was lucky enough to be offered mine from the vendor! I love wings and these look so good. Love the korean BBQ style! These are totally wings that I wouldn't be able to put down!!! And I'm not a huge wing girl! These wings look amazing! I need to get an air fryer! These wings look so crispy and tasty! I love all the flavors you picked for the sauce! Thanks Heather. Aren't they fun? I've got an airy fryer...it needs these wings ASAP! They look amazing. I was just looking at an air fryer yesterday and wondering what I would make in it! These look like perfection! I don't have an air fryer, but after reading this post, I am wondering why not. Actually, it's probably a good thing that I don't because if I made these, I'd eat the whole batch myself. These look amazing. I'm always looking for new wing recipes. This has so much delicious flavor!